A few years ago, I read Carl Honore’s In Praise of Slow and he kinda blew my mind. I should read it again before I go. After all, I’m dismantling my life to throw myself 100% at that philosophy. “Slowing down the speed of life” is something I’ve written about for a long time. 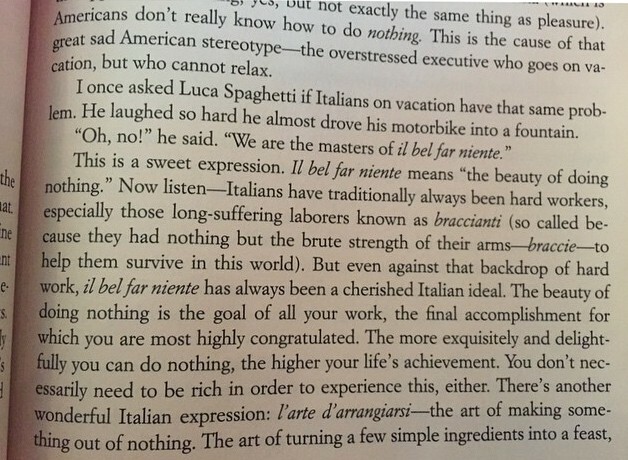 It’s why I get so wistful when I think of the European lifestyle. I’ve craved it most of my adult life. One reason I waited so long to tell others of my travel plan, of going full nomad, is people don’t take you seriously if you’re spouting off big ideas too far in advance. People talk about doin’ lotsa stuff, but do they get around to it? Often, no. In my youth, I admired so many folks because they spoke of massive dreams and I was so impressed by their vision. But that’s all it often was, a vision. Not a realization. So it’s natural to not pay much attention to such bravado. For this reason, I just shrug when people dismiss my saying I doubt I’ll return to Canadian life again later, not permanently. They don’t know. But inside, I know. I think we’ve lost life’s plot here. We don’t respect nothingness and stillness. We don’t value slowness. I feel constantly alert, constantly stressed. We’re a young continent. We have something to prove, and we never stop proving it. I know many folks with anxiety problems and I wonder, are they a product of their environment? Are they really suffering mental illness, or do they just feel this wrong, frenetic life more deeply, as I know I do? 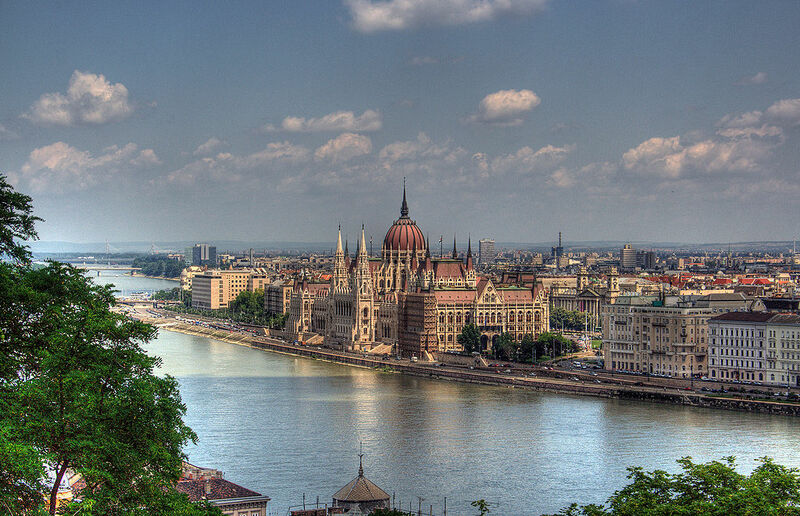 Europe, though, is preceded by most of human civilization. They’ve had titans of history rise and fall for over two millennia. We come, we go. Legacies fall away. Europeans understand that stopping in the moment serves soul well. They’ve seen the quest of riches and greatness all laid waste for folly — the Ottomans, the Romans. But food, wine, a moment on a streetside, it’s a way to life forever in the moment. In keeping with living versus working, the entire European Union mandates a month of minimum vacation leave per year (20 work days) for every employee because life is meant to be lived, not just worked. Canada? 10 days. But the United States? ZERO. Unfortunately, USA continues to influence Canadian culture. Instead of us becoming more life-oriented and less work-driven, work dominates our lives too. By Jiuguang Wang. 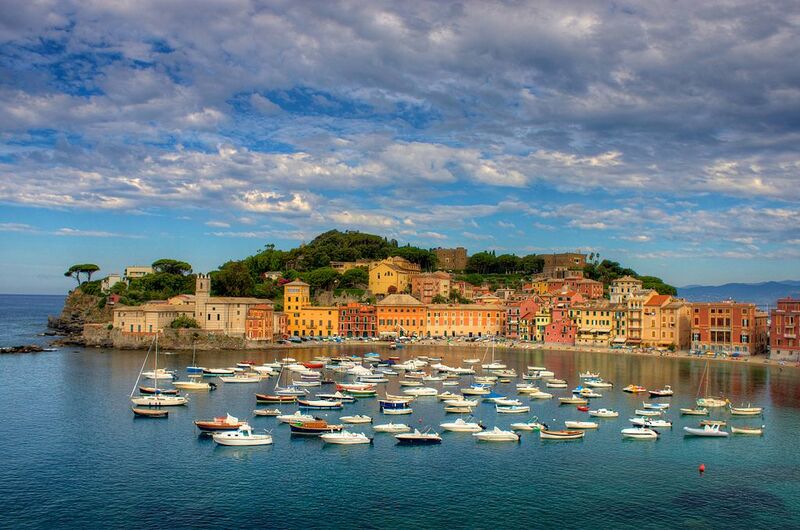 Sestri Levante and Baia del Silenzio, the Bay of Silence, on the Italian Riviera. Creative Commons 3.0 via Wikipedia. I won’t settle for a work-dominated life. I can’t. I don’t want my life to remain what it has been for over a decade — a struggle to get by. I want less so I can live more. Less work, less responsibility. Write more. It adds up to a richer life for me. I find that a sad, strange gift comes with the premature death of a parent, or with surviving one’s own brush with death. My mother died at 57. Friends started dying in my 20s. I nearly died twice at 30. It’s the realization that everything vanishes on a dime. It’s the question of whether you will leave this life feeling like you did what you had on your list. If there’s anything those encounters with death taught me, it’s that we ain’t doing life right here. Some people create their own oasis of calm, but once they step into the world around them, they’re still confronted with a culture that doesn’t cherish living in the moment, living slow. By me, an excerpt of Eat Pray Love by Elizabeth Gilbert. 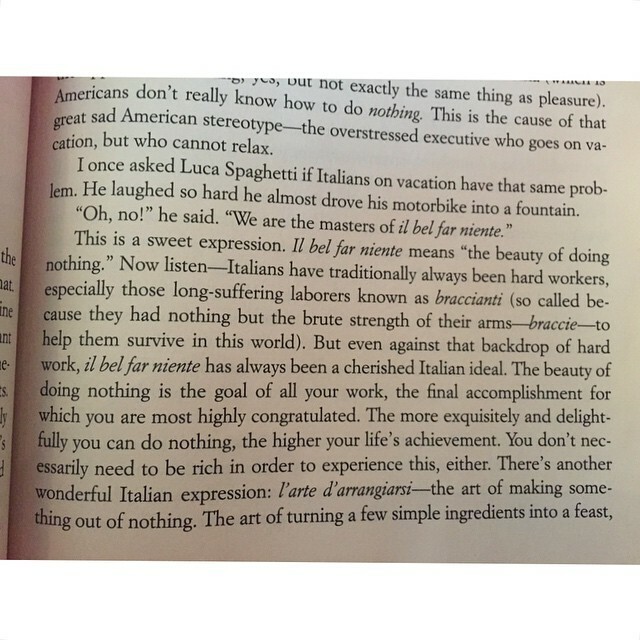 In Eat Pray Love, Elizabeth Gilbert writes of the Italian phrase il bel far niente. The beauty of doing nothing. This is what I seek. Places that understand nothingness is where we experience everything. Slowing down the speed of life is about not watching life fly by, instead opting to feel the hours slip away. Beauty lies in time-slippage. There’s a story I love about a successful American business guy visiting Mexico who gets into a conversation with a local fisherman, urging him to consider modernizing his business so he can make more money. The fisherman asks him why he should want more money. And the story goes like this. It’s a perfect example of how America gets it wrong. Instead of working so long to chase everything so they can do nothing, Americans could simply want less, settle for less, and enjoy living in the moment. After all, folks like my mom, dead at 57, never get to live dreams deferred. Today, I’m the American working constantly so I can one day afford to work less and become the poor fisherman. Unlike most folks, I see my time on the rat race wheel quickly coming to an end. 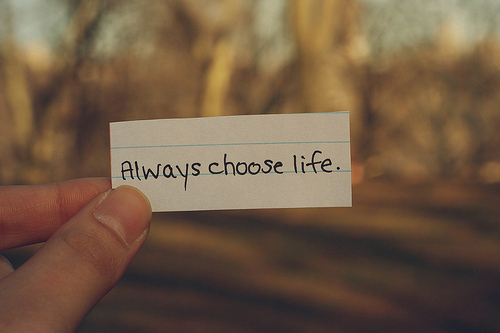 Like Renton in Trainspotting, I choose life. In about 110 days, more life and less work is what I’ll have. Until things change here, Canadian life won’t be for me when I’m done. Instead, my life waits to be discovered. I’m in an existential game of hide-and-go-seek, where a slow life of meaningfulness, thought, and presence awaits on the far shores of the Atlantic. I applaud those who find the slowness they seek here. I wish I could. It’s strange living with a feeling of constantly being in the wrong place or living at the wrong time. I need rightness in my days. Soon the search of place begins. Soon I’ll see if my soul can be soothed meandering through old towns and places history forgot. 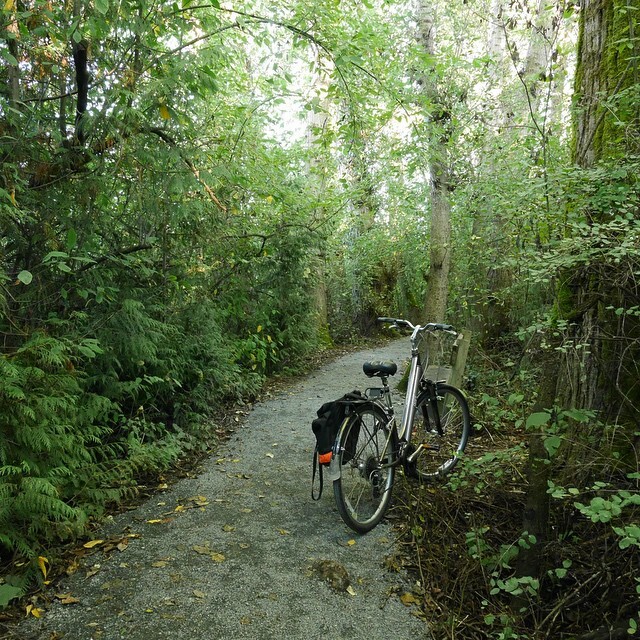 For now, I’ll hop on my bike and cycle away from town, because it’s the only way to quiet my ever-restless city mind. My bike at Swan Lake recently, the best escape I can manage these days. If you want to support my travels in exchange for cool stuff, please check out my Indiegogo campaign here.